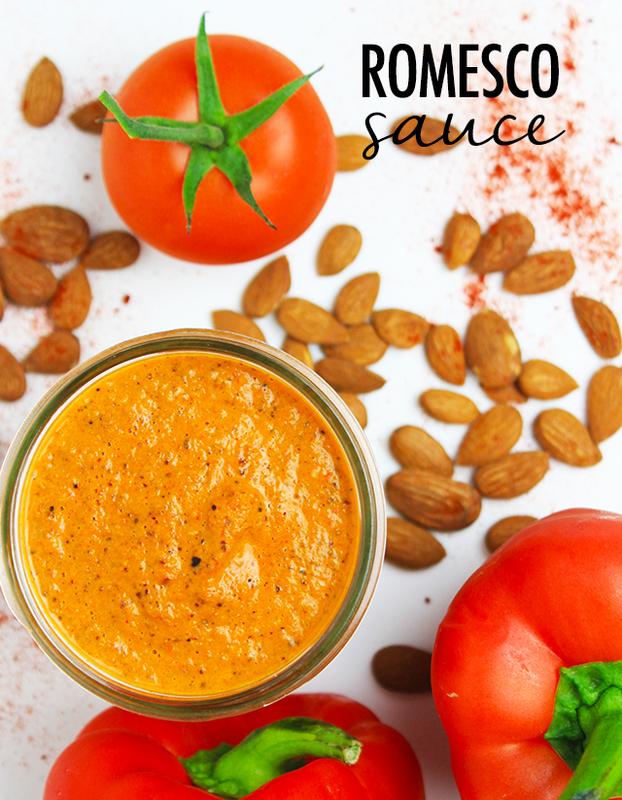 There are a lot of different foods and flavors that I crave but one of my favorites is romesco sauce. 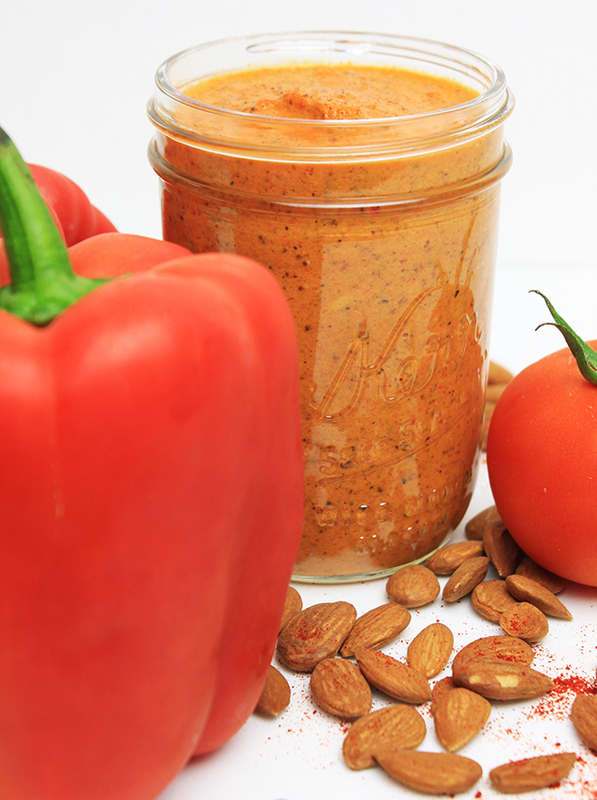 Romesco sauce is a nut and red pepper based sauce that originates from Northeastern Spain. It is often served with seafood but honestly this stuff is good as a dip, a spread, as a pesto sauce, as a marinade or even added to soups and sauces for flavor. Start by roasting the red bell peppers, tomatoes, onions and garlic in the oven at 425 degrees until soft (about 20 minutes for garlic and about 30-40 minutes for onions, peppers and tomatoes). Peel the skin from the peppers and tomatoes. Add the almonds to a food processor and pulse. Next, add all the ingredients to a food processor and pulse until smooth. The result is a really rich, smokey sauce that is crazy delicious!! 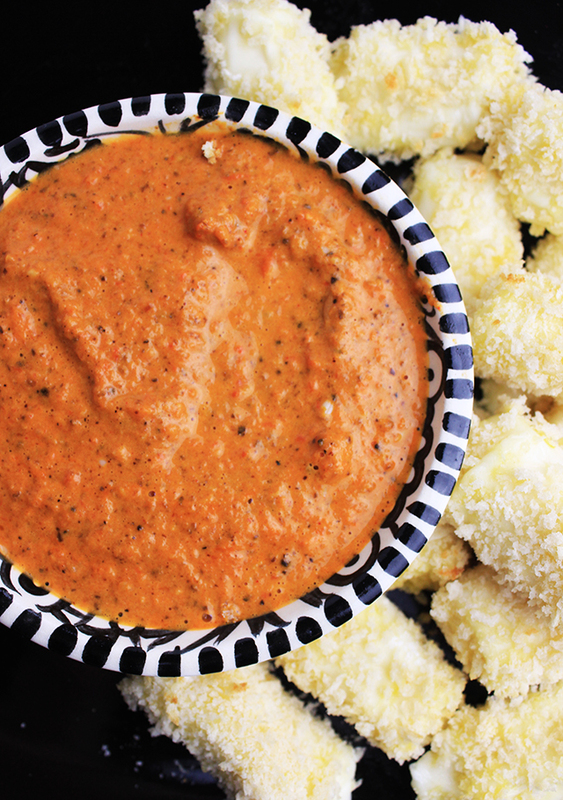 One of my favorite ways to use it is as dipping sauce for oven baked mozzarella sticks. Unwrap all of the cheese sticks, cut them in half and place them in the freezer until frozen. In a bowl, add the beaten egg. In a third bowl, add the panko bread crumbs. Remove cheese sticks from the freezer. Dip each cheese stick in the flour, then in the egg and then in the bread crumbs. Lay cheese sticks on a baking sheet covered with parchment paper. Bake the cheese sticks at 375 degree for about 5 minutes and then flip them over to the other side and bake for another 5 minutes. Remove from the oven and let them cool for a few minutes then serve warm. I will definitely have to try this recipe. Further down the coast from you in Bandon there's a restaurant that serves Seafood Romesco, kind of like a cioppino except with romesco sauce - it's one of my favorite dishes on the coast. My mother is making this very often and she loves it so much. In our conutry it's called 'Ajvar'. Haha, and I had an autocorrect in my comment! I meant muhammara! Hah! Isn't it the best when that happens! Oh that sounds so yummy!! !